There are 7 posts in this thread, and it has been viewed 6799 times. P.O.W. Prisoners of War. What do you think of it? The countless myths and legends about P.O.W.s in Vietnam may have influenced tons of novels, movies and all forms of popculture as well (think of Missing in Action 2, Rambo 2, etc). Dramatic escapes from tropical prisoner of war camps were always considered as adventureous and thrilling plots, regardless of what really happened in the course of history. Of course videogames weren't count out and even SNK ventured this legendary topic. In 1988 they released P.O.W. 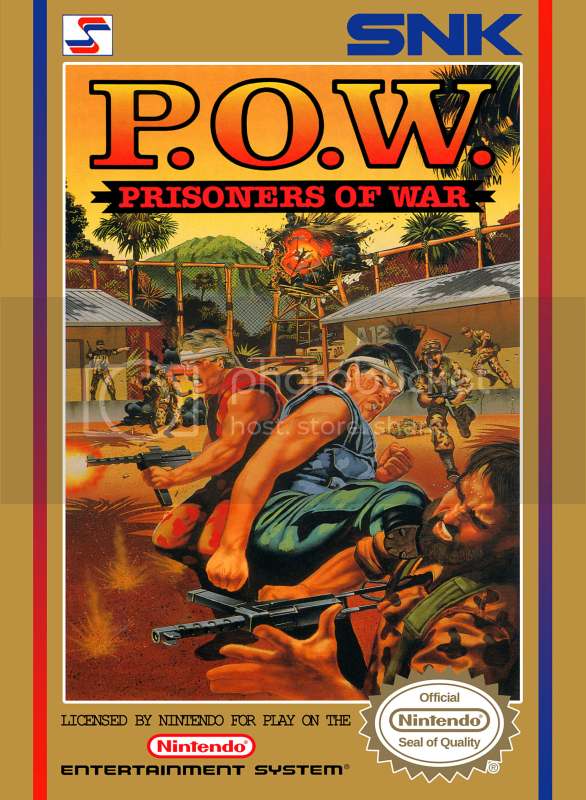 : Prisoners of War and with it another scrolling Beat 'em Up title in their library. 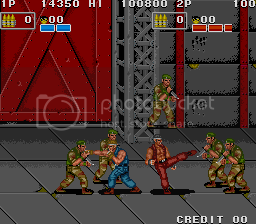 With Ikari Warriors a few years before, SNK already hit the Rambo/Commando path of gameplay. P.O.W. on the other hand was rather supposed be a stealth/survival version of it, with much more hand-to-hand combat involved. Unfortunately the game isn't held in too high regards and SNK fans rather prefer the Ikari series. What's your view on this one? P.O.W. 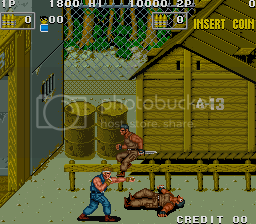 : Prisoners of War, released in Japan as Datsugoku: Prisoners of War, is a side-scrolling beat 'em up produced by SNK originally released as an arcade game in 1988. A home version was released for the Nintendo Entertainment System. The player controls a military prisoner who breaks free from his cell and must fight his way into the enemy's main base in order to eliminate their leader and escape. Just as always it's possible to organize a High Score Challenge for this one. The only thing you need to do is to show your interest by leaving an according post or by sending Priest a PM. Come on, let's give out some medals! 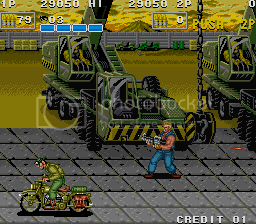 The Blond guy on the cover of the NES version, look a lot like Marco Rossi (from the METAL SLUG games)...? Coincident or did Nazca do this on purpose...? That's interesting Priest maybe the cover was by the same artist. The dark haired guy looks a bit like Steven Segal. Again a game I haven't played. It looks quite cool though, especially the way you start with punches and kicks and then can pick up a machine gun and just gun people down. The kicks are quite funny - it looks like he's soccer-kicking people as if they are footballs. That was actually my first impression too when I first saw P.O.W. a few years ago via emulation. It might be well possible that Nazca became inspired by the Player 2 model, nevertheless the characters and artstyle of the Metal Slug series were rather parodic than deadly serious (just think of General Morden and Saddam Hussein for instance). As for the cover artwork of the NES version, in fact I recently sent an e-mail to Marc Ericksen, the cover artists behind this artwork. 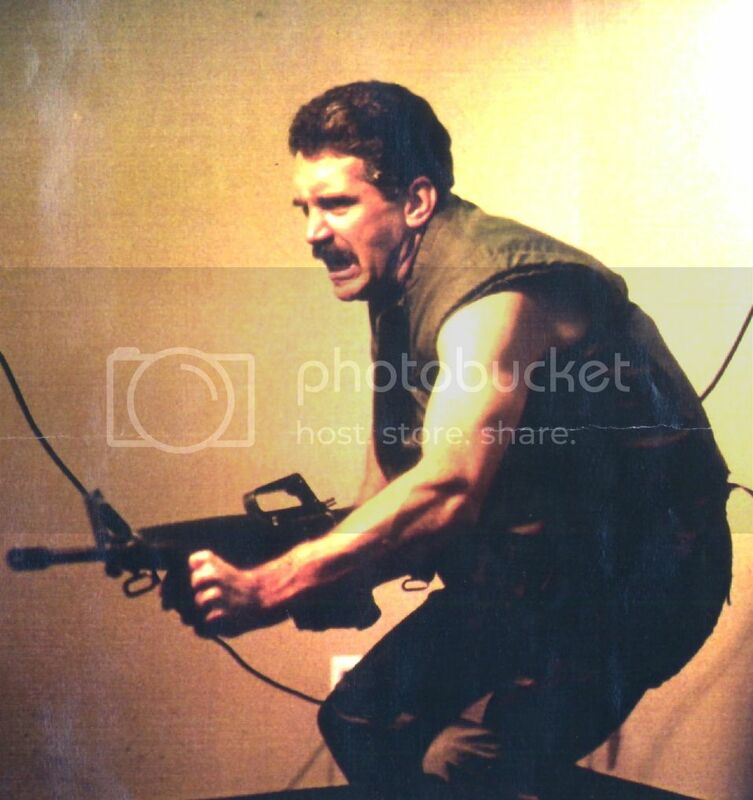 He actually did the cover artwork for Mechanized Attack, Guerrilla War and Ikari 3 too! It's a pleasure to chat with you. It's true that I am the illustrator who did the games you enjoy so much, and I'm pleased that you have a passion for the SNK games of the past. 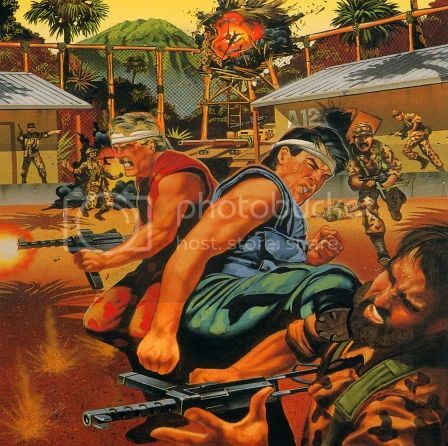 As you could surmise from retrogameart.com, I did a great deal of game cover art in the 80's and 90's, but I've always had a special place in my heart for the specific games you mentioned: P.O.W., and Guerrilla War. This goes back to my own history as the child of a service family, and my own 6 years of active duty in the U.S. Army as a young man, from 1966 through 1972, during which I served as a para, with the 82nd Airborne Division, and attended the Special Forces School at Ft. Bragg, N.C. This led to 2 years in Vietnam, first as an Artillery officer, them as an Infantry advisor with Vietnamese Regional Forces, and then with Vietnamese Rangers. Because of my close acquaintance with combat, tactics, weapons and the military, I was often selected to do some of the more exciting titles. I would be pleased to answer your questions, and to further communicate with your group. At the moment, I am composing my next post for the site, which I hope to have up by this evening, California time. Thank you for your contact, and I look forward to answering your questions in the coming weeks. I will be posting about the games you mentioned soon as well, a piece dedicated to these two games to which I am so attached. I thought you might enjoy seeing the reference shot I took of the model for P.O.W. His name is Carl Buell, and he was, for a number of years, a studio mate in my North Beach studio in San Francisco. A fellow illustrator, and also a Vietnam combat veteran, he served as my main resource for modeling. Great looking, an enthusiastic model, and a great wildlife artist in his own right! Just check out Carl Buell online. His work is fantastic. I'm also including a link to a blog post that his son Bryce Buell did a year or so back that reprises what it was like for a young boy to watch and participate with his dad Carl and me in our photo shoots. In fact Marc is a really friendly guy, you might want to check out his blog (which I already mentioned back in the Guerrilla War thread). There you can find a much wider selection of cover illustrations he did back then - jewels you can't find nowadays anymore! A Game of the Week thread with an interview with someone involved with the game? This could be a NGFL first! 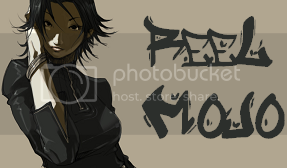 Thanks for sharing, Murikov. I love reading little bits of information from people who were involved with retro games, often times even when it's about a game I've never played. I have fond memories of POW from when I was a kid. It was one of the first arcade games I ever played. I loaded it up somewhat recently and did not like it much at all though. Not that it wasn't great at the time, it just hasn't aged as well as it could have. It had some cool ideas that helped shape later entries in the genre though, so while it might not be the most fun to play now it's still an important piece of gaming history. As yet another entry in gaming's 1980's love affair with Vietnam War imagery it tends to be overlooked more often than it should. Still, if you want a beat'em up with a heavy emphasis on guns I'd recommend The Punisher by Capcom. Decent beat-em-up. P.O.W. is a fun game but for me proves less successful in overcoming its repetitive nature than other examples of the genre like Double Dragon, with bland visuals, average tunes and little in the way of environmental interaction. It just doesn't hold up to the test of time quite as gracefully in my opinion. Still, the game is much better than many other scrolling brawlers released in arcades around that time. Not too shabby, SNK!